Snap peas are plump and juicy and can eaten pod and all. Although they are similar to snow peas, they really aren't the same. Snow peas are broad and flat and harvested with the peas first begin to form and used in stir-fries. Snap peas on the other hand have edible pods - but the peas are allowed to form inside the pod before harvesting. These tender pods release a burst of flavor with every bite and are served raw as a tasty snack, cooked in stir-fries or steamed and served in the pod. Location: Snap peas, like others peas, require 6 to 8 hours of direct sunlight a day. Some mistakenly assume that because peas prefer cool soil, they also like shade. This simply isn't true. The secret to growing healthy snap peas is to plant them in the sun in early spring before hot weather hits. Soil: Snap peas prefer organic-rich, well-drained soil. Till the soil to a depth of 8 to 12 inches and amend it with generous amounts of organic matter, such as compost or well-rotted manure. A 2- to 3-inch layer worked into the top 6 inches typically does the trick. Fertilizer: Apply starter fertilizer before planting, following the recommended application rate. Either 5-10-10 or 10-10-10 is fine, unless your soil test indicates other needs. Work it into the soil well to avoid injury to young roots or seeds. Side dress the peas when they are 4 inches tall by sprinkling a band of fertilizer along the rows, 4 inches from the base of the plants. Work it into the top 2 to 4 inches of the soil with a garden hoe. Planting: Plant snap peas in early spring as soon as the soil can be worked. Soak the seeds over night in tepid water to speed germination. Pea seeds swell to twice their size, as they take in moisture, so be sure to allow plenty of room in the bowl or bucket when soaking them. Plant seeds to a depth of 1 inch and cover them with soil. Burpee Seed recommends a depth of two inches, but I find this is too deep for my Maine soil. Space seeds 2 to 4 inches apart in rows. Support: Some snap pea varieties reach a height of 5 feet or more, while some dwarf varieties grow 18 to 24 inches tall. Tall varieties require a trellis or fence for support while dwarf variety require little support. For best results, erect fences and other supports before planting the peas. Watering: Water snap peas deeply once or twice a week, depending on the weather and soil conditions. If the soil feels dry one inch below the surface it is time to water your peas. Harvesting: Harvest snap peas when the peas have filled out inside the pod - but before they become overgrown. 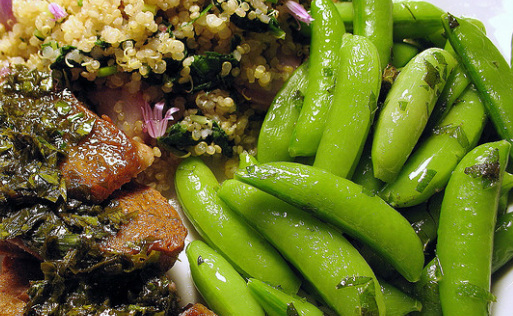 Serve raw as a snack, cook in stir-fries or steam and serve snap peas in the pod.